Once you know your way around the basics of using a scroll saw, you can get some great inspiration from a large selection of scroll saw pattern books, many of which are available at Highland. 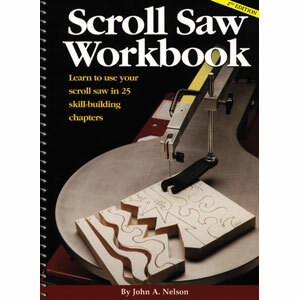 The book that Ben recommends most highly for beginners in the video below is The Scroll Saw Workbook, which builds your skills chapter by chapter. I think for the craft of scroll sawing, the best way to learn is by doing it. If you can make shapes that interest you, that will inspire you to return to the workshop again and again to keep improving your skills. And without further ado, the final video of this 5 day series on Scrollsaws, with Ben Arthur. We hope you’ve enjoyed watching! This is a five day series of videos. To start at Day 1, click here. To see the previous post, click here. Why not show installing the pinless blade through a starter hole for insde cuts on the material? Thanks for your comment! This was our first go at on-site video demos, and we are learning quite a bit about what to do better next time. One item that is definitely on our list to film in our next series is exactly the process that you mentioned in your comment. If you keep your eye on the blog, we will be sure to include that in the coming months. Sorry we missed it the first time! We really appreciate the feedback. Thanks again.